Owner Match Group said the swiping app will have more than $800 mln in revenue this year. Shares have tripled since its 2015 debut as it rakes in money from subscriptions. The successful model only highlights the shortcomings of the social network’s wannabe status. 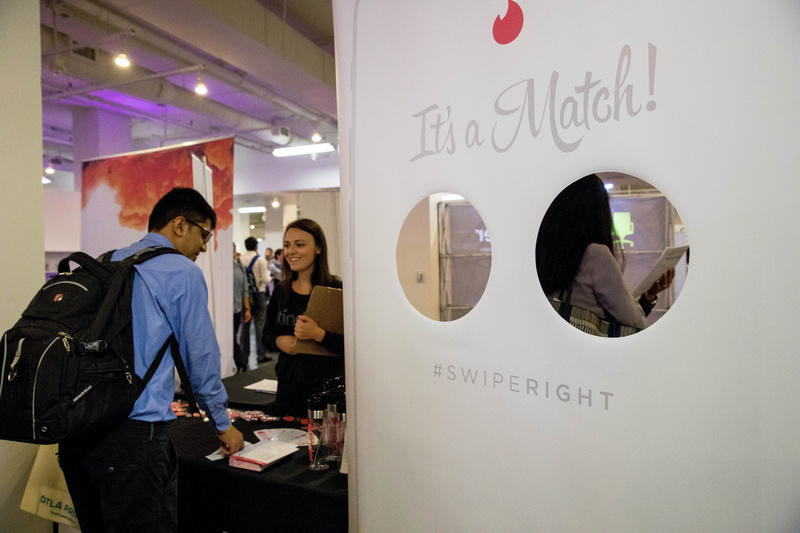 Job seekers and recruiters at the Tinder table gather at TechFair in Los Angeles, California, U.S. March 8, 2018. Match Group Chief Financial Officer Gary Swidler said during a second-quarter earnings call on Aug. 8 that Tinder is on pace to exceed $800 million in revenue in 2018. The company, which also owns dating sites Match and OK Cupid, reported after the market closed on Aug. 7 that second quarter revenue rose 36 percent year-over-year to $421 million. Net income was $132.5 million, or 45 cents per share, compared with $51.4 million, or 17 cents per share, a year earlier. Shares of Match Group rose 8 percent to $49.28 on Aug. 9, bringing its gain since the earnings announcement to nearly 27 percent.